phrase “nurses eat their young” until I started working. Had I known, I might have studied something else! It sounds naïve now, but I was shocked that a profession built on caring was so cruel to its own members. My personal strategy for dealing with it was to keep moving until I found a work environment that didn’t expose me to being either a target or a witness to these negative behaviors. However, after continuing to hear from other nurses, new and experienced, how the problem persisted I knew more had to be done. The idea for looking at workplace mistreatment as a social justice issue started with a conversation I had with one of my professors. 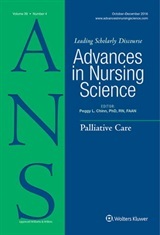 Horizontal violence, incivility, and bullying have appeared in the nursing literature for over 30 years. It was time for a new viewpoint, one that could get people interested enough to want to do something about it, and at the same time acknowledge that patient outcomes were also a concern. Social justice was the answer. Delving into the social justice literature I came across Powers and Faden’s (2006) theory. I believe viewing workplace mistreatment through their model of the six dimensions of well-being (health, personal security, respect, attachment, reasoning, and self-determination) highlights the gravity of workplace mistreatment, and demonstrates that this issue reaches far beyond the individual having a bad day at work, or having trouble getting along with other personalities. Powers and Faden’s (2006) theory is now the theoretical framework for my dissertation. The goal of this future study is to add to the knowledge base of workplace mistreatment so that the nursing profession, hospital administrators, and the public, will advocate for change and develop interventions to eradicate this problem. This paper was a team effort, a culmination of my course work at the Christine E. Lynn College of Nursing at Florida Atlantic University. I would like to thank all of my professors past and present. In particular, I would like to thank my co-author Dr. Joy Longo who has devoted the last several years to studying horizontal violence and helped to bring this article up to the level worthy of appearing in ANS. Also thanks to Dr. Pat Liehr, who encouraged me to expand the section on social justice after my first draft. Powers, M., & Faden, R. R. (2006). Social justice: The moral foundations of public health and health policy. New York: Oxford University Press. Hello Christine – Congratulations on your wonderful scholarship with this article. I enjoyed your insightful application of Powers and Faden’s (2006) theoretical framework to this very timely topic. Very interesting! Thank you for sharing your work with me! Great article.